Never Enough Nails: OPI Does Your Christmas Shopping For You- You're Welcome! OPI Does Your Christmas Shopping For You- You're Welcome! 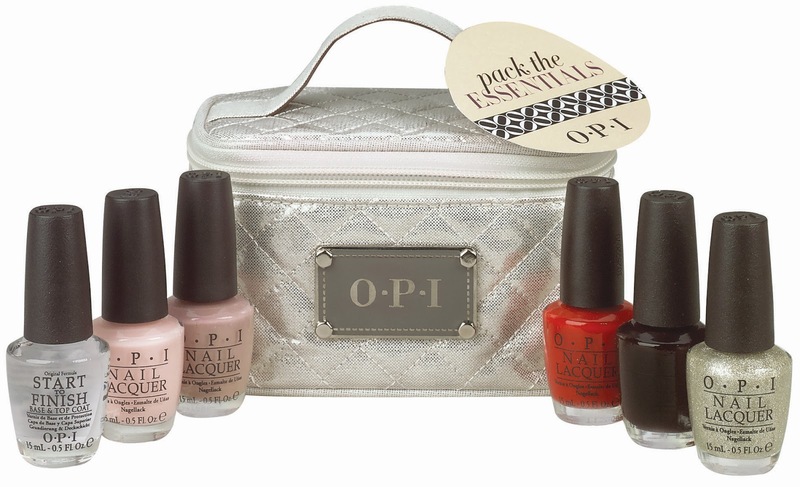 OPI launches three new gift sets this holiday season – Pack the Essentials, Fit to Be Tied and Sweet on My Beau. Each gift set includes holiday-inspired hues in festive packaging, perfect for giving and receiving. Pack the Essentials contains five classic nail lacquers in rich hues of purple and red, champagne glitter and soft pink and neutral cremes, plus Start-to-Finish, packaged in a quilted train case. Fit to Be Tied features three duo gift sets, each containg two lacquers and three glitter hair tie bracelets. Sweet on My Beau features two soft shades – Alpine Snow and Sweet Heart – and includes a metallic cosmetic bag with bow decal. Pack the Essentials includes the following lacquers: Bubble Bath, Tickle My France-y, Big Apple Red, Lincoln Park After Dark and My Favorite Ornament, as well as the treatment Start-to-Finish, which gives lacquer a glossy finish and protects nails especially during the harsh winter months. Fit to Be Tied duo #1 includes Mariah Carey Holiday Liquid Sand shades It’s Frosty Outside and Emotions, duo #2 includesRussian Navy and Polka.com, duo #3 includes The Thrill of Brazil and Black Cherry Chutney. Pack the Essentials, Fit to Be Tied and Sweet on My Beau will be available October 2013, at Professional Salons, including Beauty Brands, Beauty First, Chatters, Dillard’s, jcp Salons, Pure Beauty, Regis, Trade Secret, ULTA and ulta.com. Pack the Essentialsretails for $49.95 ($59.95 CAN), Fit to Be Tied retails for $15.95 (19.95 CAN) each and Sweet on My Beau retails for $15.95 ($19.95 CAN).